Click here for instructions how to see a live system demo. An updated overiew has been made for the newest software, follow this link. We exclusively use Elan g! controllers as the backbone of all systems regardless of size. This is because Elan g! is the most cost effective solution at our entry level, yet the most reliable solution at the maximum of residential audio/video and home automation design. Scalable from a single room to a hundred rooms, Elan g! provides simple, reliable, and predictable results. It has very few limitations as far as scale and operation. Unlike other backbones, if Elan g! offers integration with a third party device it is guaranteed to work and is fully supported by the manufacturer. The following is a shot of the entire Elan g! family of user interfaces. They include remote controls, touch panels, and Apple/Android devices. They have a beautiful, simple design that is very easy to use. We will dive deeper into all the functionality of the Elan g! system as we continue. The entire Elan g! family of interfaces has the same look and feel as all of it’s counter parts. This leads to simplicity because once you have learned to use one device, you have learned how to use them all. All of the interfaces, including the gHR200 remote control, operate on WiFi, which means no pointing and shooting and no misreading button pushes like a traditional RF system. If you are connected to your home WiFi, all Apple/Android devices will automatically login to your system when you open up the Elan g! app. If you are not connected to your WiFi because you are away from home you can still login to your home system by entering a username and password. Your control is just as good away from your home as it is in your home. This means that if you are on vacation and need to let someone in your house, you can pull out your phone to unlock your door and disarm your alarm system. Then just as easily, lock it back up again. Pictured above is a white Elan g! 7″ touch screen. This is what we will use to demonstrate how to manage the system, but no matter what interface is being used whether it’s a phone, a tablet, or your computer, it will all look and feel the same. The touch panel above is showing the main screen. This is the command center to control any part of your home. If you want to monitor or access your security system, just select the security icon. Likewise for any other pictured icons. The important thing to know is that you can start with as little or as many icons as you like. If your system is only controlling an audio and/or video system, then the only icon that you will see on your screen is media. Later, if you decide to add climate control integration, you will see both the media and the climate icons. We use Elan g! because it is a repeatable result, no matter how many devices it’s tied into. Not pictured above is the pool/spa, irrigation, and intercom icons. We will now drill down into control of the various subsystems. The below image is a screenshot from the computer interface after the “Media” icon has been selected. Pictured above is a screenshot of the media tab after it has been selected. It will bring up a list of rooms, give you the current state as “Playing Direct TV” or “Off,” and then it allows you to control all volumes from a single screen. There is no limit to the number of rooms that you can have, it will populate as many tabs as necessary. To turn on a room, select the room and then select what you want to hear or see. If we select the family room, we will be taken to the choices of what to hear or see, pictured below. If you wanted to watch TV you would select the “Tivo” button (If you used a Comcast or DirecTV DVR the appropriate image and name would be displayed). Once you hit the “Tivo” button the TV would turn on and the surround sound would engage. This Tivo button would also appear on the family room remote, which would be a more comfortable way to control the TV. I have a video demonstration of this when using the gHR200 remote control. If you wanted to listen to music you would simply select the “Music” tab, and then you would decide what you want to listen to. For instance, if we selected the “Music” button and we wanted to listen to Pandora we would get the image below. Regardless of what you want to hear or listen to, it can be added to the Elan g! interface. The system pictured above is using the Mirage Media Server by Autonomic controls, however, we could achieve the same result using a system like Sonos. It would look and feel exactly the same. Pictured below is a screenshot after the security tab has been selected from the main page. You can clearly see which zones are faulted, and which zones are clear. You can also bypass zones if necessary, which is way easier in the Elan g! system than on the security panel itself. You can arm your home in “Stay,” “Away,” or any other mode that you have programmed. You can also disarm your system whether home or away from home. The disarm feature requires you to enter you security key, which means it is just as secure as your regular security keypad. Your system can also be programmed to generate emails or push notifications when your system is armed, disarmed, or the alarm is currently going off. You can stay connected to your home without even thinking about it. Pictured below are a few screenshots of the climate tab interface after it’s been pushed. If you have just one thermostat, it will default to that thermostat’s screen. If you have multiple thermostats, it will give you a quick view of all of them and then let you select them individually. Depending on your thermostats, you can also see a graph of their usage. Pictured directly above is the schedule tab in the climate control. You can set one schedule for when you’re home and another for when you’re away. If you integrate security, your system will always know if you’re home or not and will run the schedule automatically with no input from you. Elan g! integrates with the most common custom lighting control systems such as Lutron Radio Ra2 and Vantage. Pictured below is a custom lighting page. Lighting pages are one of the only pages that are uniquely custom built. Lighting integration is not just about being able to control your lights from a phone, but also about the ability to have your lights react automatically to certain circumstances. You can have a foyer light automatically turn on to an 80% dimness when it is nighttime and your alarm is armed. You can also have your exterior lights turn on every night at sunset, and turn on again after sunrise. Above is a screenshot of the lighting scheduler. Simply select a time, sunrise, or sunset and which lights you would like to go on or off. You can also schedule modes for if you’re home or away. So, if arming your alarm puts your system into “Away” mode, and you select the foyer light to be on between sunrise and sunset then your foyer light will automatically come on when your security system is armed and it’s nighttime, but not while you are home (armed in “Stay” mode). Your lighting system can also be integrated into your alarm system with a panic mode. If your alarm is tripped, you can have all of the lights in the house immediately go on so that a burglar is no longer obscured by darkness. Then, you can have all of your exterior lights flash on and off to make clear to responders which house is under duress. It’s nice to know what’s going on at your house while you’re away. With an integrated camera system you can take a quick look at your home to make sure that nothing is wrong, or that you didn’t leave the garage door open. With a network video recorder (NVR), you can also record content to review at a later date, which is great in the case of burglary. Pictured above is the main video screen that you arrive at after the video icon is selected. By touching any of the images they are enlarged to the full size of the display. If you have a front gate, buttons can be put on the gate display so that you can open and close them remotely. The same goes for a door camera and door locks. A pool or spa is a large consumer of energy. The Elan g! system can run schedules that will limit the use of it’s energy at night or when you are away. It also enables you to keep the temperature lower because you are now able to go to a touchpanel or pick up your phone and raise the temperature before you’re ready to get in. 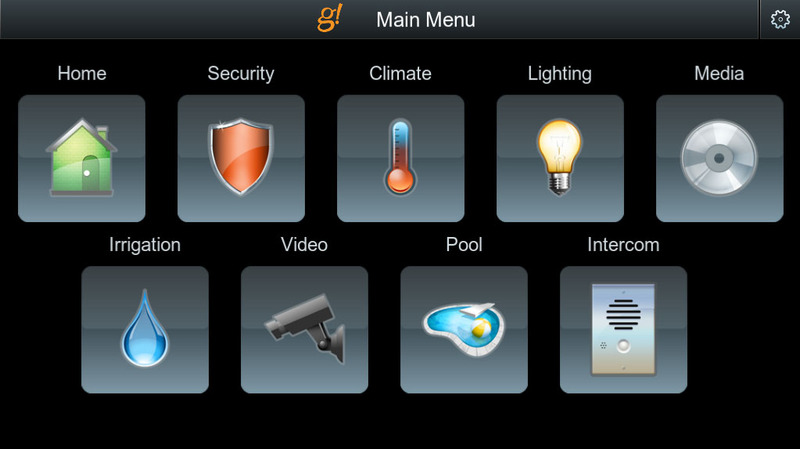 With integration to certain pool controllers you also have the ability to control the lighting and other custom functions of that particular system. Pentair pool controllers offer the best integration, but Jandy Aqualink RS works as well. You have the ability to set Irrigation schedules based on odd/even watering schedules. The irrigation system can also be manually turned on and off. You can also view graphs of your water usage. The Elan g! system makes it easier than ever to conserve water by changing schedules according to how your lawn and garden are currently doing. In the middle of summer you can increase the watering frequency while in the rainy spring you can cut it down to every third day. The system is highly customizable, which is what makes it a perfect fit for all of our residential system designs. It is also remotely programmable so that any programming can be changed without having to visit the site. It allows for the most responsive customer service and technical support. A high level of automation is possible, and as the homeowner grows used to the system they will form opinions about the level of automation that they currently have and any features that they would want added. We enjoy this system because we make these modifications and alterations at a very minimal cost. How much does an Elan g! System Cost? Complete smart home systems which include the Elan g! system as well as all of the audio video equipment can range between $10,000 to $150,000 depending on the size of the home. At myEASYTEK, we give you the absolute best price and guide your installer through the installation. If you are building or renovating a home, we have a cost calculator to give you a free estimate on how much your particular system might cost. Also, be sure to check out the services page to see how our process works.